These had to remain a secret until after they went to their respective owners. One was for my karate instructor, who reminds me periodically I still haven’t made her the golden bat she asked for back in 2010. The other was for a gift swap for my knitgroup, an awesome bunch of ladies I love to hang out with. 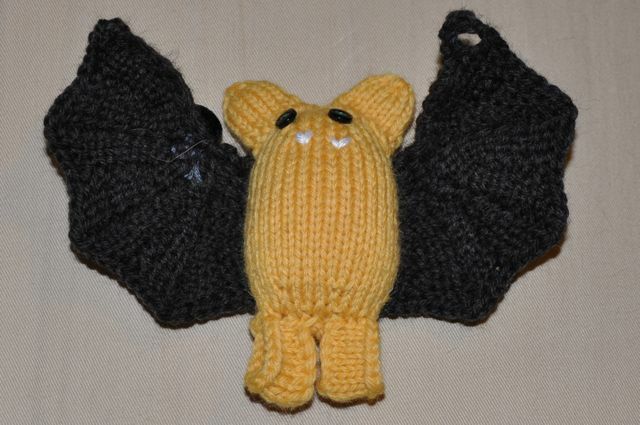 I did different wings to the pattern, using a wing designed by a Ravelry user nosmallfeet, and I think these wings are much more bat-like than the pattern wings. Oh, wait… A gift for a karate instructor? Then he’s fierce, very fierce. And warrior-like. And chain mail jewelry sounds like fun. I have a bracelet I bought at the Renn. Fest years ago that I love.